Many people get confused about what is electrical degree and mechanical degree. Well, to get a clear idea about this we have provided the following post. We consider an alternator with two poles once and four poles once to clearly understand about electrical degree and mechanical degree.An alternator consists of conductors on stator and poles on rotor. But for understanding purpose we consider conductors are rotating and poles are stationary. Because of relative motion between conductors and poles emf is induced inside the conductor. Consider a two pole alternator with a conductor as shown in the following figure. Position 1 :At this point velocity vector V is parallel to magnetic flux lines of poles(indicated by dotted line). So at this position conductors do not cut the flux lines, there will not be change in flux so emf induced inside the conductor is zero. Position 2: Now conductor rotates to position 2.Velocity vector V is perpendicular to magnetic flux lines of poles. So at this position maximum amount of flux is cut by conductors, there will be maximum amount of change in flux so emf induced is maximum at this point. Position 3: Now conductor rotates to position 3.At this point velocity vector V is parallel to magnetic flux lines of poles.So at this position conductors do not cut the flux lines, there will not be change in flux so emf induced inside the conductor is zero. Position 4: Now conductor rotates to position 4.Velocity vector V is perpendicular to magnetic flux lines of poles. So at this position maximum amount of flux is cut by conductors, there will be maximum amount of change in flux so emf induced is maximum at this point. So for one complete rotation of a conductor i.e, 360 degrees there will be two maximum positions of emf this is indicated in the following figure. 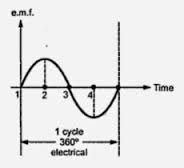 Induced emf inside the alternator is sinusoidal in nature.Two maximum peaks is 360 degrees.Conductor rotation angle is mechanical degree and emf wave cycle degree for one complete rotation of conductor gives electrical degree. Here mechanical degree is equal to electrical degree which is 360 degrees. Since for one complete rotation of conductor one complete emf cycle is produced. Consider a four pole alternator with a conductor as shown in the following figure. 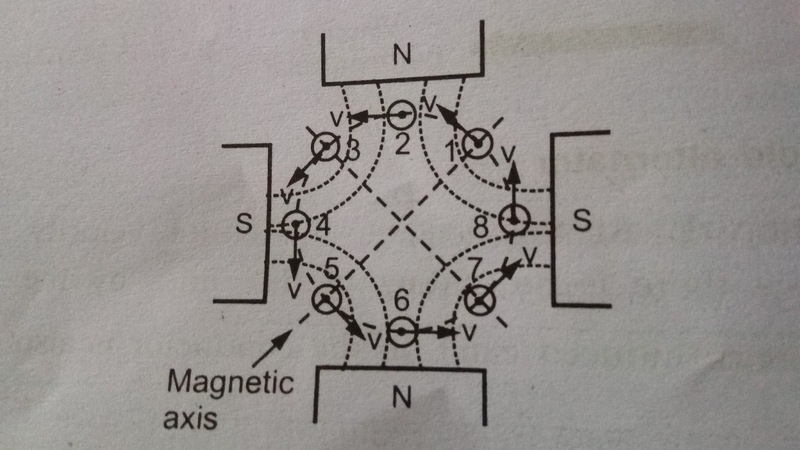 Position 5: Now conductor rotates to position 5.At this point velocity vector V is parallel to magnetic flux lines of poles.So at this position conductors do not cut the flux lines, there will not be change in flux so emf induced inside the conductor is zero. Position 6: Now conductor rotates to position 6.Velocity vector V is perpendicular to magnetic flux lines of poles. So at this position maximum amount of flux is cut by conductors, there will be maximum amount of change in flux so emf induced is maximum at this point. 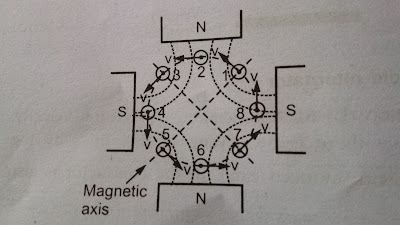 Position 7: Now conductor rotates to position 7.At this point velocity vector V is parallel to magnetic flux lines of poles.So at this position conductors do not cut the flux lines, there will not be change in flux so emf induced inside the conductor is zero. Position 8: Now conductor rotates to position 8.Velocity vector V is perpendicular to magnetic flux lines of poles. So at this position maximum amount of flux is cut by conductors, there will be maximum amount of change in flux so emf induced is maximum at this point. So for one complete rotation of a conductor i.e, 360 degrees there will be four maximum positions of emf this is indicated in the following figure. 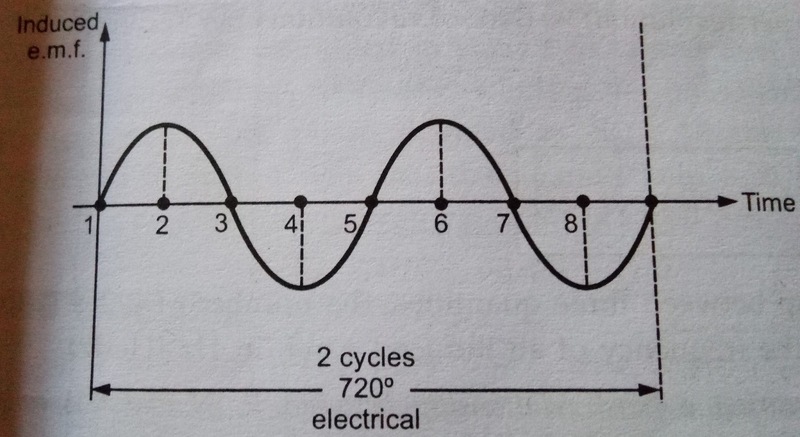 Induced emf inside the alternator is sinusoidal in nature.Four maximum peaks is 720 degrees.Conductor rotation angle is mechanical degree and emf wave cycle degree for one complete rotation of conductor gives electrical degree. Here mechanical degree is 360 degrees and electrical degree is 720 degrees. Since for one complete rotation of conductor two complete emf cycles are produced. 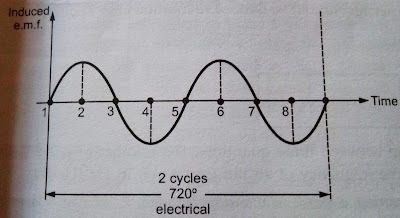 1° mechanical = (P/2)° electrical. In this post we have discussed about difference between mechanical degree and electrical degree.